One word leaps to mind in considering the Nobel Committee’s announcement yesterday that this year’s Nobel Peace Prize would be awarded to President Barack Obama: premature. Alfred Nobel’s will was very clear on who could nominate someone for the peace prize (members of national parliaments or congresses, political science or philosophy faculty in universities, and persons who have already won the prize) and who would determine (in secret) the recipient (a committee formed by the Norwegian Storting or Parliament but whose members cannot include sitting members of the Storting or the Norwegian government). But Nobel’s will (largely because he wrote it without legal help, distrusting lawyers) is notoriously vague on the criteria for winning the Peace Prize. This has led to a wide variety of Nobel Peace Laureates in the century plus of the award–from pacifists and peace activists, human rights activists, to politicians and diplomats from many countries, to organizations that work for peace in a wide variety of ways. The award has been given for diplomatic efforts leading to the end of wars and to signing of peace treaties. It has been given for relief work in the midst of war (e.g., the International Red Cross and Crescent Societies, Doctors Without Borders, etc. ), for aid to refugees. It has been given for efforts in arms reduction, or to nonviolent social movements, and for efforts to eliminate major causes of war and violence such as poverty, ethnic or religious conflict, or environmental threats. But the vagueness of criteria for the recipients of the Nobel Peace Prize has led to some very odd choices: most notoriously when former U.S. Secretary of State Henry Kissinger and North Vietnam’s chief negotiator Lu Duc Tho (neither a person of peace) were awarded the Prize jointly for negotiations toward ending the Vietnam War. Lu Duc Tho became the only person in history to turn down the Nobel Peace Prize saying, rightly, that no peace had been achieved and that the talks were breaking down. Another time the Nobel Committee made an embarrassing choice designed to encourage a peace process was when they jointly awarded the prize to Israeli Prime Minister Yitzak Rabin, Israeli Foreign Minister Shimon Peres, and head of the Palestine Liberation Organization, Yasser Arafat. Both Rabin and Arafat had previous histories as terrorists and some argued that Arafat had not yet abandoned that role. One member of the Nobel committee quit in protest. The selection President Obama is not that bizarre. In fact, if his ambitious foreign policy agenda is successful at any of his peacemaking goals: a just two-state peace between Israel and Palestine, reversing the nuclear arms race, etc., then I fully expected that he might be a future Nobel Laureate. But this seems, at best, premature –even to Pres. Obama to judge from his reaction. Yes, he has stopped U.S. torture, although failing so far to hold any of the torturers accountable and pushing for the continuation of the practices of indefinite detention without trial (for some al Qaeda members that the administration believes guilty of crimes but cannot prosecute because the evidence was obtained by torture under the Bush regime) and rendition. But the prison at Guantanemo Bay is not yet closed and the “detainees” have not been either tried in regular courts or released. Yes, he has begun the slow ending of the occupation of Iraq, but most of our troops are still there. Yes, he wants to restart the Israel-Palestinian peace process, but has failed so far to get Israel to stop building new settlements or get Palestinian factions to reconcile with each other or stop stockpiling weapons for future attacks against Israel–nothing has yet happened. Yes, we are scheduled to have nuclear arms reduction talks with Russia–but they haven’t yet taken place. He has expanded the war in Afghanistan and started an undeclared one in Pakistan with predator drones. He wants a new engagement with Iran that leads to their abandoning of their nuclear weapons ambitions and, eventually, to the first resumption of U.S.-Iranian diplomatic ties since 1979–but no progress has yet been made and recently he seemed to imply a willingness to bomb suspected Iranian nuclear plants. The hawkish Obama has proceeded apace, but the Obama who dreams of peacemaking has yet to move from hope to actual change. Thus, I call this award premature, and Obama himself calls it “a call to action.” That, I suggest, is how peace activists from around the world should react–not by mocking or condemning this choice, but by using it as moral leverage in encouraging real peacemaking from this administration. As filmmaker Michael Moore said yesterday, “Congratulations, Mr. President–now go out and earn it.” That should be the unanimous note of peace activists–encouraging this president to live into the award that he does not (yet) deserve. Announce that the U.S. will “re-sign” the Anti-Ballistic Missile Treaty “unsigned” by former Pres. Bush. Since the legality of “unsigning” a ratified treaty is murky (and unprecedented!) under both U.S. and international law, I doubt that this would even need ratification by the U.S. Senate–but with 60 Democratic Senators, such ratification should be pro forma. Announce that the U.S. will “re-sign” the Treaty of Rome that authorized the creation of the International Criminal Court and will join the ICC instead of continuing the Bush-era attempts to evade the ICC’s jurisdiction. Joining will require Senate confirmation, and some will balk out of fear that the ICC might attempt to try members of the Bush admin. for war crimes related to torture and rendition if the U.S. does not prosecute them, but Obama should take that risk. Sign the International Treaty Banning Landmines. The U.S. is one of the few democratic holdouts even though American Jody Williams (who won the Nobel for her efforts) founded the International Campaign to Ban Landmines. Even many famous generals around the globe support this since landmines are of limited military value in war, but continue to kill and maim civilians long after wars are officially over. Sign the Treaty Against Child Soldiers. Former Pres. Bush refused because he wanted the U.S. to still be able to have 17 year olds in the military–but out military will hardly crumble without them. And this treaty gives some teeth to efforts to stop the kidnapping and forced induction of adolescent and pre-adolescent children into both government and rebel armies–most notoriously by the so-called “Lord’s Resistance Army” in Uganda. Announce an increased pace of the U.S. military withdrawal from Iraq. Announce an end to use of the predator drones in Afghanistan and Pakistan because of the enormous loss of civilian life. Deny General McChrystal’s request for additional troops in Afghanistan. Freeze at current levels while re-thinking Afghanistan–seeking a new way forward. Announce that the U.S. will unilaterally reduce its nuclear weapons by 10% across the board. We need MUCH deeper cuts around the globe, but this unilateral step could jump-start the talks with Russia and show the world that you are serious about reversing the nuclear arms race. It could be a transforming initiative that invites similar moves on the part of others. Beyond these steps, the way grows harder and must include cooperation from both Congress and international partners. Grassroots peace and human rights organizations should do our part by supporting the actions the Obama administration takes for peace, praising them, and encouraging more and criticizing steps in the wrong direction. Also, not waiting for governments or prizes, we need to continue our own, independent, actions for peace. Yes, I wrote that. No, I have not been a big fan of Secretary of State Hillary Clinton and I was against Obama appointing her to Secretary of State. (Of course, I’m happy that my first choice, Gov. Bill Richardson (D-NM) was passed over, because it would have been far more embarrassing for him to back out of the S of S post due to Federal Elections investigations than it was when he removed himself from Commerce! Sheesh!) I have never shared the rightwing “Clinton hatred” (which has been shifted to Obama), but I was critical of her husband’s presidency (mostly as squandered potential for good) and her candidacy for the presidency. But I think a “prophetic stance” that ONLY yells at politicians when they screw up is counterproductive. One should ALWAYS send notes and phone calls of appreciation when a politician, ANY politician, does something right. It greatly increases the chances they will continue to do so. So, today, I sent Secretary Clinton a thank-you note because in Israel this week, she publicly criticized the government of Israel and the government of the city of Jerusalem for demolitions and planned demolitions of Palestinain homes in East Jerusalem. She rightly called it a violation of Israel’s agreements on the so-called “road map” to a two state peace. (She did not say, as she could have, that it was a violation of International Law and about a thousand UN resolutions, including many agreed to by several U.S. administrations of both parties, but she said something!) Make no mistake–as hard as it will be for my international readers to understand, in the U.S. context this is an act of political courage. Secretary Clinton will get TONS of hatemail and criticism from rightwing pro-Israel-no-matter-what groups and their well-financed media allies over this. ANY criticism, no matter how small, of Israel by an American politician carries a political price that it does not anywhere else–not even IN Israel. Now, after emailing or phoning the Secretary and thanking her, send a copy of that email to President Obama, and (if you are a U.S. citizen) to your Congressperson and Senators–regardless of party. Then write your local newspaper and commend Secretary Clinton’s words in public. If you are a Christian minister or Jewish Rabbi, PLEASE take this last extra step–because the media will be flooded with condemnations of Clinton’s words by rightwing Jews and Christians who claim to speak for everyone of their faith. If you belong to a group like Churches for a Middle East Peace or Evangelicals for Middle East Understanding, or Rabbis for Human Rights, etc., put that in your message. It will raise awareness of the diversity of views and, hopefully, change the nature of the debate in the media and Congress. See the full text and video of his speech here. This is not everything a Christian pacifist and nonviolent activist like myself could want, but it is a GREAT step in the right direction. He has adjusted the timeline: “Combat” troops out by August 2010; Residual force (mostly for training Iraqis) of 30-50,000 (seems large); ALL troops out by 2011–respecting the Status of Forces Agreement Bush made with Iraq. We’ve been in Iraq WAAAAY too long and if we in the peace movement can put pressure into stepping up the pace, we should. But ALL troops out is more than Obama would commit to as a candidate. Obama was against the invasion of Iraq from the beginning. This is important to note because this marks a first in U.S. history: The very first time that a principled opponent of a particular war was elected president WHILE THAT WAR WAS STILL ONGOING–and while campaigning to end it. The economic crisis (recession, depression–who knows) helps him work to end it–we simply cannot afford this war any longer. The phase out will involve the United Nations and the surrounding countries–a huge change from Bush’s “go it alone” policies. Honoring the SOFU with Iraq, honoring Iraqi sovereignty, is a major step in rebuilding our compliance with international law. Obama’s withdrawal timetable now has the support of McCain and other Republicans! I know, this surprised me, too, especially since McCain spent the entire general election campaign last year calling Obama “naive” on foreign policy and suggesting that he wouldn’t care if we were in Iraq 100 years! But this bi-partisan support–even if the number of GOP supporters is few–will make it harder for the rightwing hawks (in and out of the military) to pressure Obama into slowing down the withdrawal or stopping it–or make political hay out of his keeping this campaign pledge. Now for the major criticism: As we are winding down Iraq, we are increasing troops in Afghanistan–and without much national or Congressional debate, with no timeline, no clearly defined mission. I have mentioned before that I believe Afghanistan could be for Obama what Vietnam was for LBJ–the Achilles’ heal that undoes much of the good he tries to do domestically. We need to Get Afghanistan Right! and that means recognizing that there is no military solution–even if there theoretically was one when Bush largely abandoned Afghanistan to invade Iraq–a nation uninvolved with al-Qaeda or 9/11 and which was no threat to us! Watch the video, sign the petition, and contact your members of Congress to Rethink Afghanistan! 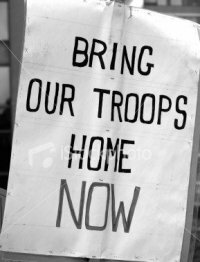 New polling suggests that the American people want to find a way out of Afghanistan, too–certainly by 2012 at the very latest. Meanwhile, Paul Rieckhoff of Iraq and Afghanistan Veterans of America (IAVA), points out that the country needs to get ready for the return of these vets. We already have too many homeless and jobless vets and these returning soldiers will be coming back into the worst economy in decades. We aren’t prepared for their return and MUST get that way, quickly. Overall, these are positive developments. Now, as peacemakers and persons of faith, let’s do our part to keep things moving in these directions. Grief and pain over what is happening in Gaza has kept me from posting much on this, but I could not omit a link to this tragic story. We must get a cease-fire, NOW, and re-start the peace process and invest heavily in getting a just peace (2 state solution) in the near future. Too many decades of occupation and resistance (often using terror tactics) have perpetuated this and too many lives have been lost. This needs to be front burner. Rabbi Michael Lerner, editor of Tikkun and leader of the Network of Spiritual Progressives, has outlined a great Strategy to End the Israel/Palestine Struggle One and for All. I recommend it and hope it circulates widely–and I hope people keep emailing it to the Obama transition team and to Speaker Pelosi, Sen. Majority Leader Reid, their GOP counterparts in the Minority and your own representative and senators. Also, send it to your local papers. I know Rabbi Lerner slightly and have long admired his writings and leadership among progressive religious leaders. (We have met at a meeting of the Baptist Peace Fellowship of North America in ’06 when he was a guest speaker and from 2 gatherings of the Network of Spiritual Progressives.) This outline is not new. It builds on his book, Healing Israel/Healing Palestine. While we pray for peace, let us work for peace in concrete, practical ways like proposed here. UPDATE: Brian Kaylor has an article on Ethics Daily that gives descriptions the Gaza crisis from Baptist leaders in the region, including the Baptist pastor who is the only Protestant minister in Gaza. I am sure descriptions from other church leaders in the region would be similarly at odds with the ultra-pro-Israel blindness of most U.S. Christians. UPDATE II: Kaylor has another Ethics Daily article that shows how a factually inaccurate story on Baptist Press has spread to other Christian news sources. This kind of thing is why U.S. Christians (and Americans generally) are so ill-informed about the Middle East. Then they let their prior theological commitment to Israel at all costs color their interpretation of what is happening in any current crisis. In the not-t00-distant future I want to write a major blog post on why I am so strongly in favor of URGENT action for a just 2-state peace in Israel-Palestine. I just can’t do it, now. I am too anguished to do more than pray. Suffice it for now to say this: Until the mid-’80s, even after I became a pacifist, I was a zionistic, mostly uncritical supporter of Israel. My next door neighbors growing up were elderly Jews with numbers tattooed on their arms–Holocaust survivors. And my first young awareness of Middle East issues was shaped by the 1972 attack on Israeli athletes by PLO terrorists at the Olympic Summer Games in Munich. That shaped my views. I was convinced that all Palestinians were terrorists and that liberal failure to support any actions Israel took was due to anti-Semitism. Even after becoming a pacifist in ’83, I thought all the blame was on the “Arab” side. It wasn’t until I started meeting Palestinian Christians in the mid’80s that my views began to change–as I realized how one-sided the U.S. media is. I still deplore Palestinian terrorism (or anyone else’s terrorism), but the state-sponsored terrorism of Israel, including starving whole peoples, should not get a free pass. The Israeli press does NOT give a free pass. If you go to the English-language sites of the major Israeli newspapers, you will find a huge range of views–hawks to doves to pro-Palestinians–views that would be suicide for any U.S. editor to allow. There is more debate in the Israeli Knessett (Parliament) than among U.S. politicians–who outdo themselves working to try to be more pro-Israeli and hawkish on Palestinians than others. This DEEPLY distorts U.S. views, especially those of U.S. Christians. I would say more, but I can’t just now. I am worried for my friends the Awad family (Palestinian Baptist Christians who are leaders of the nonviolent movement that gets ZERO attention in the U.S. press) even though they live in the West Bank, not Gaza. If Christian, Jewish, and Muslim leaders would all travel to Gaza to be nonviolent human shields and call for a cease fire, maybe we could stop the madness. I am no religious leader, but I will volunteer to be in any such delegation. We cannnot wait for governments. We must act NOW! UPDATE: Renewed violence in Gaza, with Israel targetting Hamas leaders (and, as usual, hitting numerous civilians along the way) and promising an incursion “that will not be short,” and Hamas launching retaliatory rockets and calling for a renewal of suicide bomb attacks, calls such as these are needed more than before. Religious and other peace leaders from around the globe need to converge on Israel-Palestine and put themselves in harm’s way an unarmed human shields in order to stop the madness. We cannot have half-measures nor handwringing, but need bold, nonviolent action–NOW! As Christians of the Catholic, Evangelical, Orthodox and Protestant traditions, we are united by a Biblical call to be peacemakers and a commitment to the two peoples of the Holy Land who yearn for a just peace. As Americans, we urge you, Mr. President, to make achievement of Israeli-Palestinian peace an immediate priority during your first year in office. The conflict between Israelis and Palestinians has gone on too long. It has caused untold suffering for both sides, created economic hardships, and provided a rallying cry for extremists. As people of faith and hope, we believe peace is possible. Majorities of both Israelis and Palestinians continue to support a negotiated solution based on two secure and sovereign states as the best way to end this tragic conflict. Your commitment to working for the establishment of a viable Palestinian state alongside a secure Israel can help strengthen U.S. security and improve stability and relationships throughout the Middle East. We believe that Jerusalem – home to two peoples and three religions – has the potential to become a powerful symbol of hope and coexistence for people across the region and the world. We know the work for a just peace will not be easy. It will require great courage and resolve, but the risk of inaction is even greater. Without active U.S. engagement, political inertia and perpetuation of the unbearable status quo will make achievement of a two-state solution increasingly difficult. Moreover, we are concerned about the negative impact a further delay will have on the Christian community in the Holy Land, whose numbers continue to decline. We call on all Christians and people of goodwill to join us in praying for the peace of Jerusalem and in supporting vigorous U.S. diplomatic efforts to secure Middle East peace. Mr. President, as you take up the many challenges facing the United States and the global community, we urge you to work for a better future for all the children of Abraham in the land that is holy to us all. General Secretary, The American Baptist Churches, USA. Executive Director, Mennonite Central Committee U.S.
American Christians nationwide are invited to add their names to the leaders’ call for Holy Land peace. Deadline is Jan. 16, 2009. Pres. Bush plans to call for an Israeli-Palestinian peace conference–but only wants to invite parties he considers “moderates” (but that won’t rule out the rightwing Likud Party in Israel!). That’s not going to work. We need all affected parties to have a stake in making the process work. So, a number of organizations have begun a petition to the U.S. Congress to call for a more comprehensive international conference for Middle East Peace. To read the petition, view current signatories, and/or sign yourself, click here. As Sami Awad notes on his blog, Never Give Up, the nonviolent resistance of the West Bank town of Bil’in has met with a victory. The Israeli Supreme Court has ruled that the so-called “security fence” (apartheid wall) must change its route and NOT cut off Bil’in from its farmland. Of course, the entire wall needs to come down and a two state solution must be negotiated soon. But it is this kind of nonviolent resistance, along with international pressure, which will create this new future. I hope those Palestinians who prefer violent resistance note this victory–a victory not one by Hamas’ methods. I also hope Israelis noticed and learned. Many Palestinians in Bil’in were injured by Israeli soldiers during the nonviolent resistance. They must have been tempted to strike back. I am so glad they resisted not only the soldiers, but also their own impulses. Nonviolence takes discipline and courage and a willingness to suffer. Pray for villagers of Bil’in and for a swift end to this wall.